Our next gallery update for Seibertron.com is a special one: it is none other than the Transformers Collectors' Club Free Membership Incentive Ramjet! This figure uses the Generations Armada Starscream mold along with all its accessories, but with a brand new head. You can click on any of the images below to view the full gallery. We'd like to extend a Special thanks to the Transformers Collectors' Club and Pete Sinclair for the opportunity to photograph this exclusive figure in advance of its release! Looks so gorgeous. The colors, the details, the head, everything looks so right and accurate to what it's supposed to be. More updates to non-G1 characters with non-G1 looks are always welcome. I weep for that which I will never own this gorgeous figure. Just absolutely stunning Ramjet is. Good job, Fun Pub, good job! Deadput wrote: I weep for that which I will never own this gorgeous figure. I'm a Club member, so I'll be getting him. If I don't really like him, I might be able to hook you up. Glad I plan on renewing this year as usual. Looking forward to this one; more Armada homages, please! I beg of you! I'm curious as to how the head works for jet mode. I assume there's more empty space on the back of his head that would allow him to look all the way up as you fold the head down? That's the only way I can see him being able to transform, really. Decepticon Sunstorm wrote: I'm a Club member, so I'll be getting him. If I don't really like him, I might be able to hook you up. If I ever learn how to use paypal or get a real credit card soon I'll be interested. My bet options currently is to either mail money or purchase a prepaid credit and put some money in it although I doubt it works outside Canada. If you have a current bank account, PayPal is quite easy to set up, even for international transactions. What you really need to worry about are shipping costs which can get quite high when crossing borders, and exchange rates. While this is a GORGEOUS figure, I don't understand why the swords are just clear plastic. Why not a fiery red translucence to make them more interesting? Damn, that looks gooooood. Hopefully this and Skywarp end up on the aftermarket- I kinda want to make an Armada Seeker Trio with Legends Armada Starscream and Thundercracker (yes I know he's technically "super mode" Starscream but that ain't stopping me) and Club Skywarp. I'll take Skywarp over Ramjet, if only for the sake of the trio. 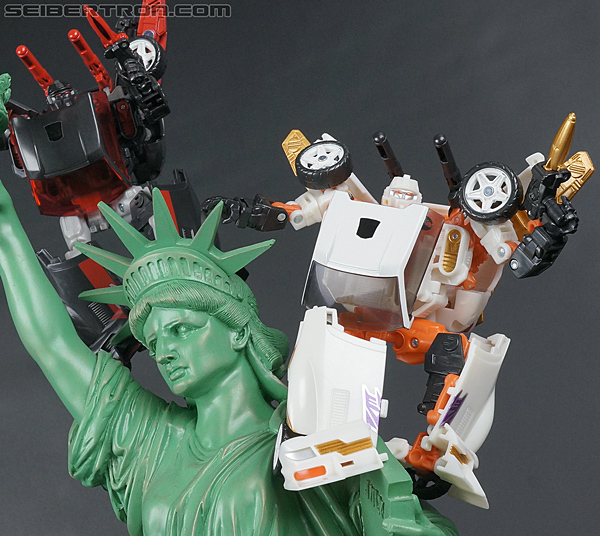 Mindmaster wrote: I'm curious as to how the head works for jet mode. I assume there's more empty space on the back of his head that would allow him to look all the way up as you fold the head down? That's the only way I can see him being able to transform, really. Do you have an Armada Starscream from Generations handy? That might be the easiest way to explain it, if you're looking at him. The head was always designed on a ball joint, but the Starscream head was designed with a horizontal bar across the back of the socket. This little tiny bar is all that prevents Starscream from doing the same thing that Ramjet does. So when designing the Ramjet head, Fun Pub made sure to keep that back of the socket with plenty of clearance, as well as angling the bottom of the helmet so that it wouldn't hit the neck or "collar bone". This allowed for pretty much a full back-of-the-head to be sculpted without any really obtrusively ugly gaps or anything. Microraptor wrote: While this is a GORGEOUS figure, I don't understand why the swords are just clear plastic. Why not a fiery red translucence to make them more interesting? Most of the clear plastic is all on the same tree/part of the same tool. Gray was chosen for a couple of reasons, but chiefly to make the translucent parts of the missile launchers match the look of the original figure's jet mode. (The launchers on the original were gray, white, and blue.) The original sword was also mostly white and silver (with a blue tip), so gray did seem to make some sense for the swords as well. I guess that makes sense. Though on the topic of weapons, I must ask: Have you ever thought about making a character a new weapon instead of a new head? Because I need more bots with chainsaw-swords. All the way back at BotCon 2005, Ratchet received a new-mold "shield" accessory that could be placed in vehicle mode as his lightbars. I believe that is the only new-mold accessory that has been created (other than the 2007 Vector Sigma). Otherwise it has been trying to find existing weapons from Hasbro's existing library of tools, like the Targetmasters from Scoop and swords from Optimus ExPrime that were used for TFSS 4.0, the Construct-Bots weapons that were used for Oilmaster, and Arcee's arsenal that was given to Impactor. There are quite a lot of existing tooling for weapons, so that's where Fun Pub has been looking for the most part whenever they've decided to add more character-appropriate accessories. TF_JW wrote: All the way back at BotCon 2005, Ratchet received a new-mold "shield" accessory that could be placed in vehicle mode as his lightbars. I'd love to see some "weapon" sets, something along the lines of the vintage Masters of the Universe "Weapons Pak" sets. A lot of the Legends figures from the past few years don't have weapons, it'd be great to give Bombshell, Powerglide, Windcharger, etc a gun! Even doing something special for swords or something to match the cartoon look would be cool. And I don't want to do 3rd party accessories, something officially made by Hasbro would be perfect for my collection. Food for thought for another day! This is the 1st must have Free Subscription figure ever! Leader_Ultra_Magnus wrote: This is the 1st must have Free Subscription figure ever! Ramjet looks super sweet, can't wait to finally get him. I like that the blue turned out more pale. Makes him not looks so patriotic. Think I may like Ramjet even better than Lio Convoy plus I don't own a figure with the Armada mould. Quick, give every figure Roadbuster's mechtech weapon! Actually my fave mech tech weapon alongside reuses of the mold such as Thundercracker's and Takara Vortex's for example.